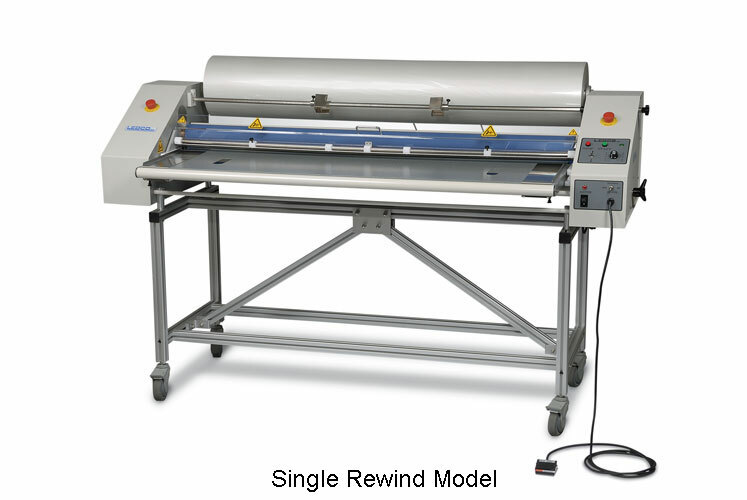 User friendly laminator to automate the application of transfer tape and other pressure sensitive adhesives (PSA, tapes or films), apply to any substrate up to 1/2" thick. Laminating widths 30, 44 inch and 60 inch. Econocraft applicators can be used to apply any type of pressure-sensitive film or tape to any substrate up to 1 inch thick. They can be used for mounting. 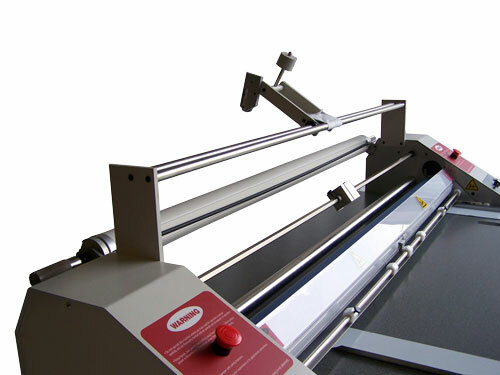 The Econocraft 60 is a heavy-duty commercial laminators designed for the most rigorous and demanding jobs and workloads. Supply Roll Core Size 3"
Maximum Outside Film Roll Diameter 12"
Weight / Shipping Weight / Shipping Weight with Stand 505 lbs. / 805 lbs. / 1,100 lbs. A foot pedal is a standard feature that frees hands to align and feed work. Side guide Left and Right side guides are supplied as standard items. A stand is included with both of the larger machines. 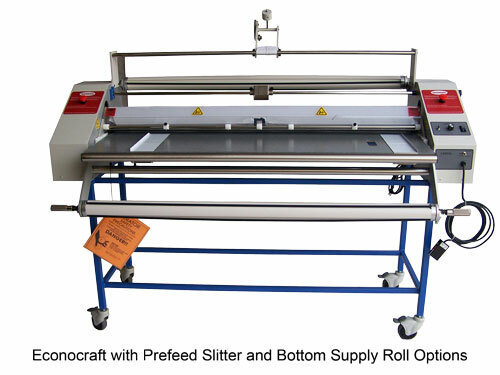 Prefeed Slitter attachment: cuts material on the supply roll for application to narrower substrates, for multiple-up production or for striping. Bottom supply roll assembly: provides for roll-fed application of materials, such as transfer tape to weeded vinyl or transfer taped vinyl to banner material. Precision feed tray: provides moveable left and right hand guides for exact feeding of quantities of same-size material. 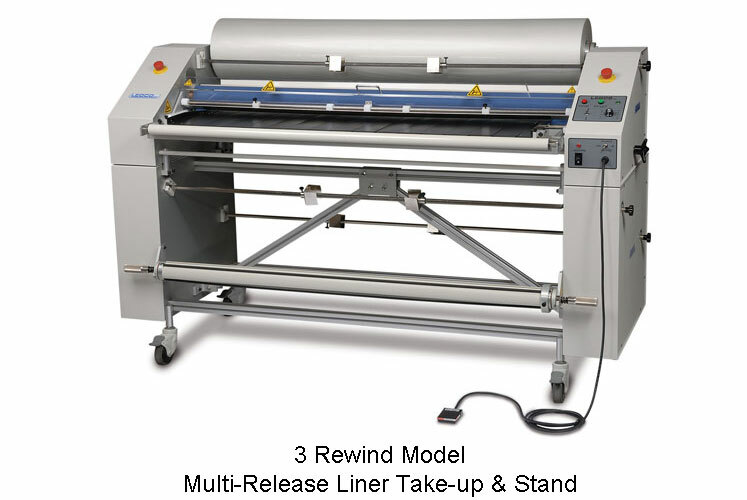 Bottom Release Liner Take Up (RLT) Option: This option is a self powered release liner take-up like the one built into the machine which, in conjunction with the bottom supply roll, allows you to apply film with a release liner to the bottom of your substrate. Part # 8360000, (2) EHR135.4B (Brackets), and (2) EHR44 135.4C (spanners).